:: Should You Tip When You Get a Spa Service? :: Belly Dance Show June 15th! We're continuing our series about what to expect when getting a spa service. This month I talk about tipping - to tip or not, how much, and when I do (and don't) tip for a service. Summer is here and I know everyone gets busy. Please keep in mind that I am also very busy trying to make everyone "presentable" for the beach, lake or pool. There are numerous ways to get ahold of me if you need to reschedule your appointment. Notifying me in advance enables me to fit in another client that may be on a waiting list, or gives me time to run errands or have a sit down lunch! Everyone is trying to maximize the time they have to work with, so please be courteous. This applies to all types of service people. I love what I do but this is my job and what pays my bills. $400 of no shows in one week is a lot to swallow - not including the clients I wasn't able to schedule that had to go elsewhere. I do have a "no show" policy; please don't make me have to be "The Enforcer!" Phone - 864.271.2710 - you CAN'T text me at this number! Text - If you prefer to text please let me know and I will give you the number you can text me on. Email - Nicole@raspberrymoonst.com - this should go directly to my phone. Facebook - Raspberry Moon is also on Facebook so you can reach me through there as well. If in 24 hours I have not responded please recontact me - I may have not received your message. I am generally in the office Tuesday through Friday. I do try to answer the phone as much as possible, but if I am with a client I will not answer the phone. Please leave a message. Everyone who experiences a Brazilian Wax in the month of June will receive a "Try Me" Package of our Hoo-Ha Post Wax Skincare Kit! It is very important to take proper care of your waxed areas to prevent ingrown hairs and irritation. Using the proper products can go a long way for a happy hoo-ha! Your girl is a sensitive being and needs to be treated as such. Should You Tip When You Get a Spa Service? I get asked all the time about tipping. What follows is my opinion when it comes to tipping in the spa industry. I believe that you tip based on the service that you received. Sure there are "guidelines" of what the percentage should be, but in the end it is still up to you. Two months ago I talked about the facials I, my mom, and my friend Susan got in New Orleans. My mom and Susan did leave their ladies a gratuity. Their services were satisfactory. I did not leave my lady any - and I almost always tip! Tipping is not a requirement. Tipping is because you had a fabulous treatment and feel the need to give an extra thank you. Tipping is because someone comes in on their day off to take care of you. Tipping is because they squeezed you in (though not to the detriment of other clients). Tipping is just because you want to. I tell people if it is a choice between tipping or coming in for an additional service each year, then you should not tip and come in more. Like I said, tipping is always appreciated but not required - I am just telling you what I do. When I buy something from a coupon deal I usually add on other services so I can get more for my money. As long as I liked the service, I tip based on the percentage on the regular amount, not the discounted amount. Always have a hard time figuring out how much to leave? 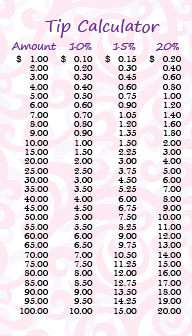 We have little tipping charts you can now put in your wallet. Be sure to pick one up the next time you are at the shop. For those of you with super smart phones, you can also download an app to help you calculate tips! After taking almost 2 years off from dancing I have jumped back in. This will be my first Belly Dance Show since diving back in, so come join the fun! Discordia Arts and their students (some for the very first time!) will delight you with dance, silk twirling, sword play, and maybe a bit of fire! Dinner seating will start around 7pm. I promise you will not want to miss this unique dining experience! The show will start at 7:30pm. We will have a short intermission with some special entertainment. This would also be a great time to grab that dessert or drink from the bar! After the show, feel free to hang a bit and dance with us! This promises to be a delicious start to the weekend! 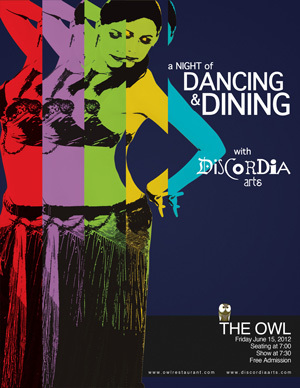 Get more information and directions to The Owl on the Discordia Arts Facebook Page. Great for the summer - leaves your skin smooth without stripping too much moisture or oil. Citrusy, sweet, reminiscent of orange peels. Tough on dirt and daily grime, yet mild enough as a face wash for children. Hemp Oil contains natural vitamins, minerals, essential fatty acids and the benefits of Omega 3 and 6 - typically available only from fish. Formulated with mild vegetable based cleansers, botanical extracts and a high level of aloe to assist in alleviating irritation and providing water-based moisture. You'll notice softer skin! For all skin types. Hemp Oil - Regular use on the skin may help slow down the effects of skin aging and leave the skin soft, smooth and moisturized. White Willow - A natural form of salicylic acid, great for exfoliation and cleaning pores. How to Use: Wet hands, face and neck; gently massage a small amount of cleanser onto face and neck. Cleanse 2-3 minutes, add more water if needed. 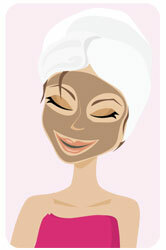 Rinse thoroughly and follow with toner and protective treatment. Ingredients: Aloe Gel*, Sodium Cocoamphoacetate (Coconut Oil)*, Alkyl Polyglucosides (Corn Starch), Cannabis Sativa Seed Oil*, Cocomidopropyl Betaine (Coconut Oil)*, Sodium Chloride, Vegetable Glycerine*, Chamomilla Recutita (Matricaria) Flower Extract* (Chamomile), Salix Alba (White Willow) Bark Extract*, Citrus Aurantium Dulcis (Orange) Fruit Extract*. *organic, wild crafted and sustainable sources. carbon balanced. Regularly $24 for 8 oz pump - Now 10% off through June! Ingrown hairs are the biggest complaint I hear from people about shaving or waxing. I put the Saucy Chica Skincare Hoo-ha Post Wax Skincare kit together to help keep your girl happy, but this is another step that you can do at home to help with this. Epsom Salt Soaks are good for your body in general. An Epsom salt soak can help to draw out the ingrown hair because of the salt's active ingredient, magnesium sulfate. Add 1/4 cup salt to a tub of warm water and soak for 30 minutes. You can also make your own scrub using Salts and you can add Essential Oils of Lavender and Tea Tree. If you feel so inclined you can add a little bit of Olive Oil for moisture. Simply scrub the area after cleansing, rinse thoroughly and hydrate if you did not add the olive oil. My mom will be here this summer so I will be gone for a little bit. July 9-14 - In VA, WV and PA - I will do my best to get back with you as quickly as possible, but my phone does not always work in the mountains. August 9-15ish - I will be in NM. I have never been to NM so really looking forward to it. 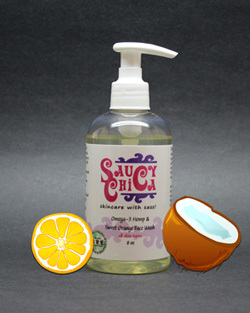 I will also be touring the "kitchen" where Saucy Chica is made and hope to be bringing back some new items!